So I popped a sliced apple in the oven at 400 degrees for about 15 minutes on a greased baking tray (give or take), and when that came out of the oven smelling like apple pie, I knew this was going to be a delight. 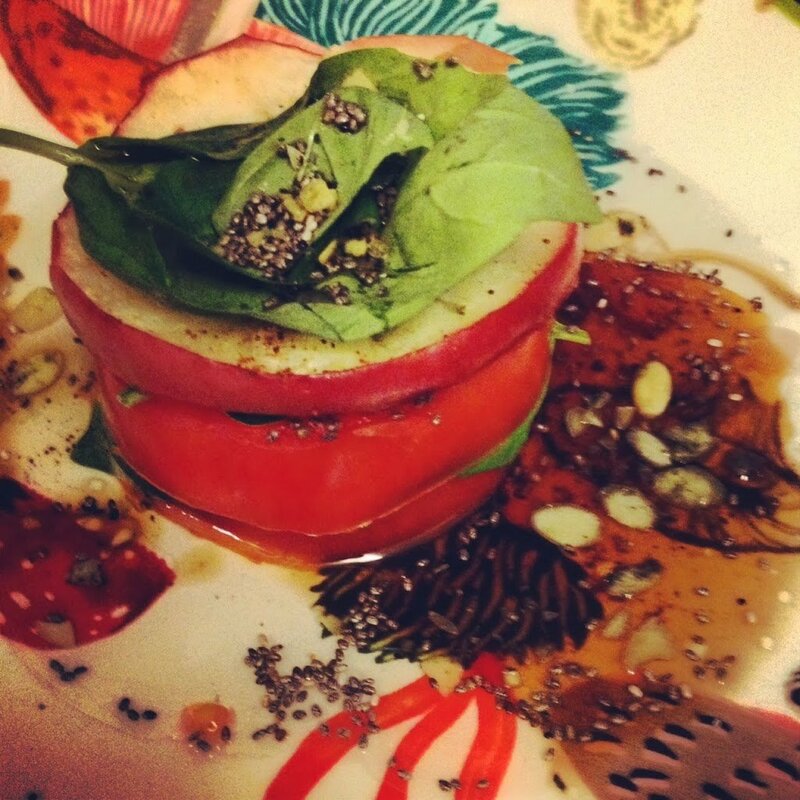 I sprinkled a little Nutmeg on the apples and prepared the apple tomato tower. I washed and sliced the juiciest tomato out of the three I had bought into 1/4-3/8 inch thick slices. I added some olive oil and Organic balsamic vinegar to the base of the plate, followed by a few pieces of fresh Basil. I let that soak for a bit. Then I added two tomato slices sandwiched by more Basil. And topped with more Basil one 3/8 thick slice of juicy baked apple. I used my Empire apples because they are the most tart and perfect for baking. You know those apples, the ones that don’t loose their sweetness in any way, just one bite actually tastes like apple pie minus the calories. Once that was done I opened my pantry to see what superfoods I had hanging around. I sprinkled chia and raw sprouted pumpkin seeds, sea salt and pepper on top along with some extra olive oil and balsamic vinegar. I was pleased. I was even more pleased when I tasted it! It was perfection. Come on, despite the fact that you think this combo is off beat, You know you wanna try it! I use Organic Balsamic Vinegar because I like the taste. I also use Raw Sprouted Pumpkin Seeds. Raw seeds are dehydrated at a lower temperature keeping the nutrients and vitamins intact and very much alive. I use Empire Apples because they are super tart, and the tart and sweetness is not removed when baking. Any dessert apple will do.